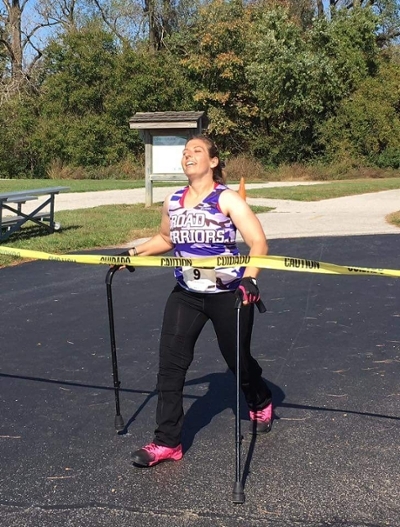 If you dare to place an obstacle in front of Southern Illinois University Edwardsville alumna Tiffany Eickhoff, prepare for it to be broken down with fierce perseverance … and a smile. A St. Louis native, Eickhoff earned a bachelor’s in applied communication studies (ACS) from the SIUE College of Arts and Sciences in 2014. She was born with Spastic Diapelgic Cerebral Palsy. But, her disability is not what defines her, rather it serves as the foundation for her boundless motivation to continuously achieve new goals. While at SIUE, Eickhoff put her mind to completing her coursework and conducting research on disability services. She found a strong mentor in Duff Wrobbel, PhD, professor in the Department of ACS. Every day, Wrobbel is reminded of Eickhoff’s determination when he looks at two tests thumbtacked on a board above his desk. After a failing grade on one of her exams, the two worked together, and Eickhoff achieved 81 percent on her second test and 104 percent on the third. Wrobbel keeps the two high scores as evidence of his former student’s determination to succeed no matter the obstacles. As part of her academic journey, Eickhoff participated in the University’s Undergraduate Research and Creative Activities (URCA) program. Her URCA work, with Wrobbel and Sarah VanSlette, PhD, associate professor in the Department of ACS, resulted in a published academic journal article, entitled “Enacted Assessment of Disability Support: A “Lived” Method for Assessing Student Life.” Prior to its publication, Eickhoff and Wrobbel traveled to Texas to present the paper at the prestigious Texas A&M Assessment Conference. Professionally, that’s what Eickhoff strives to do. She is currently searching for a role in disability advocacy and awareness. While indeed on the pursuit of finding such a position, she has also made dramatic changes to her lifestyle, which has led to tremendous physical advancement and personal fulfillment. According to Eickhoff, she used a motorized wheelchair almost exclusively during college. These days, most of the time, she walks using one cane. “As I’ve grown up, I’ve had to use a walker, canes and a wheelchair to get around at different times,” Eickhoff explained. “When I graduated from SIUE, I was at a heavy weight, and I decided I needed to take my health back. Over the past two and a half years, I have lost more than 70 pounds. I’ve also become active in a small group fitness class through Blueline Fitness Stl." Eickhoff now boasts the completion of one 10K and five 5Ks, the latest of which she ran in Springfield, Mo. on Saturday, April 1 to benefit Camp Barnabas, a camp for kids and teens with life-threatening illnesses and disabilities. Eickhoff’s perseverance has allowed her to become an inspiration to anyone who has heard her story. The moral of her story is, don’t try to put an obstacle in her path. She will overcome. She will succeed. Photo: SIUE alumna Tiffany Eickhoff is all smiles as she crosses the finish line during her 10K in October, 2016.